As the jet propulsion technology was entering the aeronautical scene just after WWII, the British government was keen to produce a light bomber capable of succeeding the highly-praised DeHavilland Mosquito. The English Electric company, which mass-produced piston engine aircraft during the war, answered the call with an original design. The result was the prototype of the English Electric Canberra Bomber. Initially, they planned to build a single-jet engine; to be centrally mounted on the hull. The idea was to produce a modified version of the Rolls-Royce RB.41 Nene ― a 1940s British centrifugal compressor turbojet engine, which was the most powerful turbo-jet engine of its era. That plan, however, was abandoned. The single turbo-jet engine, despite being very powerful for the time, did not reach the requirements of the Canberra Bomber. The engines were mounted in mid-wing position to avoid the center of gravity issues which had been the main flaw of the initial design. As a direct successor to the Mosquito, the Canberra architects used a very similar design philosophy ― a light aircraft built around the strongest engines available, to provide maneuverability and speed. Also, they included room for a substantial bomb load of 3.6-tonne (7,900 lb) and dispensed with any defensive armament. The decision not to include defensive armament also came from its predecessor, the Mosquito. The advantage gained by fighter jets was impossible to beat and adding a tail gunner was considered a waste of space and a useless addition to the aircraft’s weight. 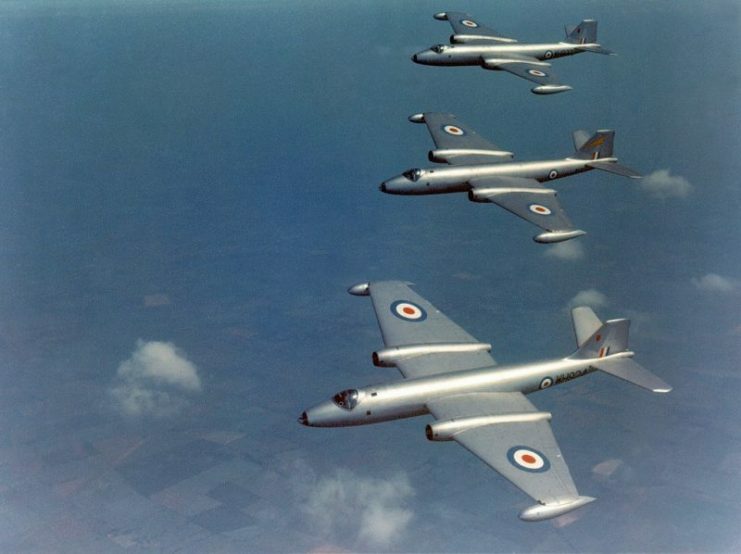 The Canberra Bomber took its first flight on May 13, 1949, as the prototype B2 VX165. Due to its high altitude ability, the aircraft was also intended for photographic and electronic reconnaissance missions. In fact, the plane broke the world altitude record in 1957, reaching a height of 70,310 ft (21,430 m). The bomber was capable of reaching a maximum speed of 470 knots (870 km/h; 540 mph) and had a standard service ceiling of 48,000 ft (14,600 m). It was also the first jet aircraft to make a non-stop transatlantic flight, setting a record in 1951. Once it went into serial production, the plane became very popular for export. The first orders for B2 bombers came from Australia, which purchased 48 units. That is when the aircraft was officially named “Canberra” in honor of Australia’s capital city. The US intended to replace its obsolete fleet of B-26 Invaders and ordered 408 Canberra Bombers built under license by the American Glenn L. Martin Company. The US model was named the B-57 Canberra. The Korean War was heating up in 1950. The British Government designated the new aircraft a “super priority,” and production orders skyrocketed. During its production, UK manufacturers assembled a total of 901 Canberras. A Royal Australian Air Force English Electric Canberra B20 from No. 2 Squadron during a strike out of Phan Rang air base, Vietnam, in March 1970. The plane was adapted to serve as a new low-level force tactical nuclear strike bomber, applying the Low Altitude Bombing System. It enabled the aircraft to deliver a nuclear payload at low altitude while managing to avoid the blast. Soon the non-Commonwealth countries were filling out orders, asking for cutting-edge bombers. 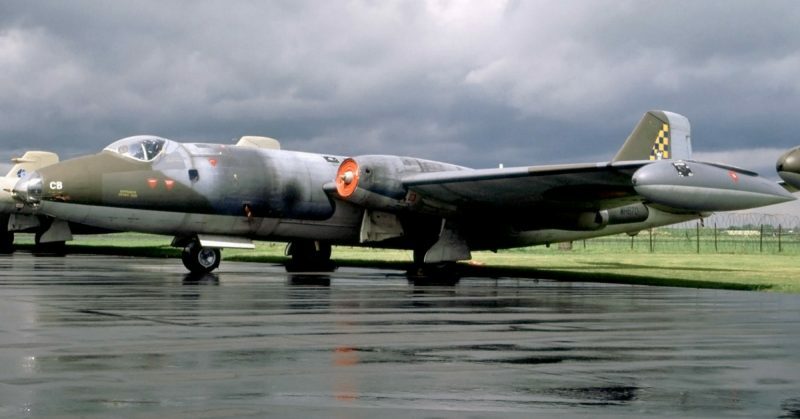 Argentina, Chile, Ecuador, Ethiopia, France, India, New Zealand, Pakistan, Peru, Rhodesia, South Africa, Sweden, Venezuela and West Germany all introduced the B2 Canberra Bomber into the ranks of their air forces. During its long service between 1951 and 2006, the Canberra was involved in many of the world’s conflicts. As the plane had been primarily exported, it was no wonder it was often seen on both sides of a conflict. In its fifty-seven year military career, the Canberra participated in the Korean War, the Suez Crisis, the Vietnam War, The Indo-Pakistani War, the Falklands War and the 2003 invasion of Iraq and the war in Afghanistan. The RAF officially retired it in 2006. Although the initial hype concerning the jet bomber made it one of the most exported military products of the United Kingdom, it became evident that jet-engine technology was still being developed. The Australian Air Force realized that the Canberra would become obsolete quickly, as jet-engine technology was on the rise. Even as early as 1954, there were more suitable replacements, such as the Avro Vulcan and the Handley-Page Victor.